This question was posted on the cams page of the mechanism pages. It's interesting so I thought I'd re-post it to the blog where more people would see it. Hi Rob, found the site this week and really like it, nicely done! I was trying to envision a cam that could be used to make the cam follower appear to pause at both and upper end and lower end (in your animation it pauses at the lower end). I realize that the pause and the top and bottom will be of different lengths of time, but that seems necessary to get the cam follower to roll along nicely. Thanks and keep up the great drawings! 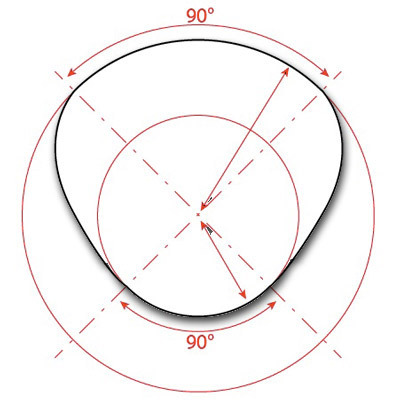 A cam is, at its simplest, a surface describing a movement, all wrapped round in a circle. The highs and lows of the surface create the highs and lows of the cam follower's path. To create a flat area in a cam, an area where the cam follower doesn't move up or down, you need an area that follows the circumference of the circle centred on the centre of the cam. In this cam there are two quarter turn flat areas. In a mechanism this would give you a cam follower that stayed high for a quarter turn, drops down, stays still again for another quarter turn then rises again. It should do what you are after. Thanks for explaining that Rob, that makes it all very clear. I assume that if I wanted to vary the length of time of either (or both) "pauses", all that would need to be done is change the amount of angle on the top and/or bottom of your picture, right? @Jason, yes, you can vary the stationary angle. 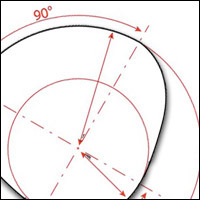 The angle where the cam follower remains stationary is known as the dwell angle. In the 135° cam to the left, the dwell angle is close to the maximum possible as the cam follower has to be able to rise from the low level to the high level.